Christian ministries and parents: let’s have less “they’re coming after our children!” screaming and more faith-based Godly swashbuckling. 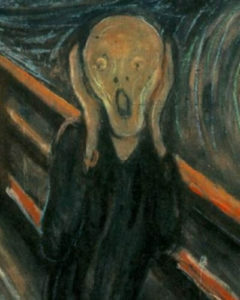 Screaming is no way to raise children, or for that matter anyone else. I refer not to angry screaming (which is bad enough) but panicked screaming. It betrays the possibility that screamers minimize glorification of God, preferring to emphasize faithless reaction to fears. People overreact based even on legitimate fears. Including parents and ministries. Now, though I dislike diagnosing problems without offering solutions, I’m unsure how to fix this. To set up my example, I’ll “out” myself: I accept six-day creation and a global flood. If you don’t, I’ll understand; I don’t boycott or cry “compromiser.” Instead I would prefer hearing you out. For example, if you accept a “day age” or “gap theory” belief, then I would try simply to ask, “Why do you feel you need to believe that?” Oddly enough, I’ve found that actually being intimidated by science or scientists and not knowing their limits may lead to people who do believe Scripture also feeling they must accept some aspects of evolution. Anyway, as one of Those, I also enjoy the work of Answers in Genesis. That’s the (in)famous Christian group that promotes “defending the Bible from the very first verse,” now from their southern-Ohio base of operations. For a few years that has included their fantastic Creation Museum, an attraction that gets little credit for the fact that it’s creatively brilliant. I love this place. The planetarium alone is creative and even “speculative.” Call me and I’ll take you there. All that praise, and now I must criticize. A little. As we embark on a new year of ministry that reaches around the world, we at AiG will be doing our best to help rescue kids (and adults) from this present evil age by directing them to the Savior and showing them that His Word can be trusted. Now if I were a Hip Cool Christian Blogger, I’d now be laughing at Ken Ham. No, that is not my point. If you argue with that post, I may argue with you — in a Christlike way, I hope. No, the fact is, I agree with everything Ham writes about here. Denying that They really are coming after the children is absurd. Of course They are coming after the children. Everyone comes after the children. And based on the Bible, parents should educate their children in the Word (and if they can, as many other knowledge fields as possible). Far more vitally, Christians even apart from parenting should practice discernment and lie-rejection. At Speculative Faith, we stress this practice particularly about fiction, but also in all areas. Rather, what I dislike is this escalating “they’re coming after your kids!” marketing. Ask yourself: what brought you into a passion for whatever Christian cause or ministry you enjoy? 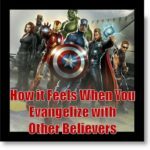 Your local church (this comes first), a denomination, a relief organization, a group of cult-busters or apologetics artists, a website, or any other parachurch outfit? I’m guessing you were not drawn aboard primarily because the group hollered at you about Horrible Dangers. Rather, you were captivated by the call to missions work. A founder’s personality. Christ’s clear influence in that organization. Your own Spirit-given desire to glorify Him. For me with AiG, I was captivated by what I can only describe as swashbuckling. Disagree with beliefs if you wish, but when I heard Ham or others speak, I was simply having a blast. I was enjoying the truth and the form. Ham wasn’t a screaming, panicking hand-waver. He was a swashbuckler. He skewered anti-God absurdities. And he laughed while doing it. That’s far better than near-constantly emphasizing “they’re coming after your kids!”. 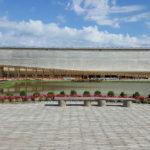 My second [Facebook] post of the new year is a plea for Answers in Genesis to reconsider some of its “they’re coming for our children!” materials. First, yes, They are coming for our children. But does that support appeals such as the recent reminder that professors are trying to teach “your children” untruths? Last I checked, if your “child” is being taught by professors, that “child” is not a child — namely, he or she is an adult. Yes, parents must teach their children, and optimally continue providing wisdom (though more similar to of a brother/sister than parent) when their children are grown. But any “protection” of people of any age from false teaching is secondary to the main goal: to glorify God and love Him and His truth by discerning and rejecting false teaching. 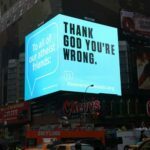 AiG does great work, but they should reject the fear-based, reactionary approach that itself frightens people as children, and makes them sneer as adults. Instead they and their materials should stress the glories, majesty, and wonder of our God of truth. Yesterday brought an official reply, which surprised me. (Most organizations’ staffers or volunteers are rightly too busy to engage every social-network critic.) But I’m not sure they get my reasons. Neither did the other person, who merely encouraged me to read Genesis. How to fix this? I don’t know. So far I’ve only designed this “meme.” You may think of better solutions. If not, you’d best hurry. Fear-based Christians are coming after your children. This kind of fear mongering is not the way to reach most kids and families, in fact, the only people this is going to reach are the family/homeschooling extremists who already believe that everything is evil. I was homeschooled my whole life and when something came on tv or on a video or something that Mom wanted to clarify, SHE DID SO. Without screaming, handwaving, claiming Satanic influences, or throwing the TV out the window. I remember we watched the cartoon Dragon Tales on PBS once, and in this show the Dragons wear jewels or charms around their necks which light up if they do something hard or brave. Well, once the show was over, Mom explained that there are people who believe (wrongly) that jewels can give you power. She taught us to examine character’s motivations, why they where doing what they where doing and whether it was right or wrong. This in turn inspired me to write my own reviews, examining the motivations so I could help families help their kids find what was right and wrong about a thing. Yes, this is the approach I like to take, too! I think the reason more parents don’t do it this way is because it involves a lot more time and interaction. To actually guide your child through the reading of a novel or the watching of a movie, you have to read it or watch it, too (ideally, with them). It’s quite an investment, and a lot of parents don’t (or feel they can’t) take the time. Glad to hear others are doing this, and to hear the testimony of a child who was raised this way! I pray my kids feel similarly about it when they grow up! Love this approach, Stephen. Thank you for standing up and gently nudging (and/or challenging) people away from a fear-based motivation to a truth-based and freedom-based motivation. We are the ones who are free and who know the truth. Surely we can stand up and joyfully point it out to others, shining the light just because we have the privilege of doing so! Why use the world’s tactics of FUD (fear, uncertainty, doubt) for advertising and motivating people to participate? 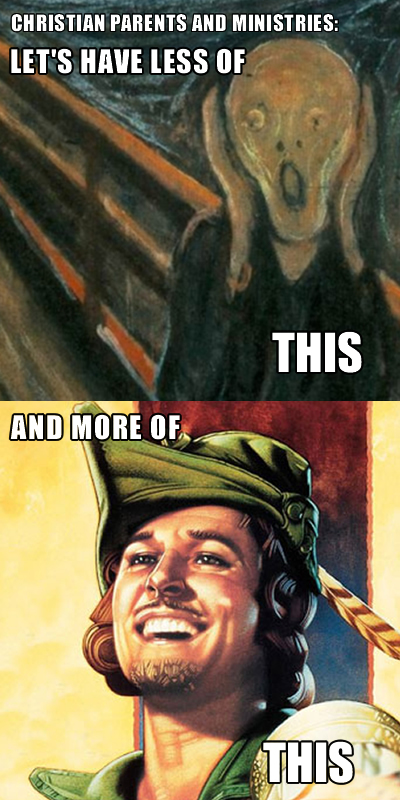 Your meme and the concept of screaming vs. swashbuckling captures the spirit of your message perfectly! Thank you for this encouragement, and for the imagery that makes it stick in my mind. I pray many are inspired by it and switch their approach. We all needs these reminders! Why use the world’s tactics of FUD (fear, uncertainty, doubt) for advertising and motivating people to participate? This is a point that I now wish I had emphasized — that these are worldly techniques. When I look at today’s discoveries (related to confirmation of the bible’s veracity via archaeology, biology, paleontology, and other sciences), I feel more equipped than ever to celebrate and spread the word about the truth of a loving Creator. This is glorious news, and His wonders are awesome and undeniable (for anyone willing to look). Why not focus on that? As a home-school graduate, I can agree that fear-based thinking does more harm than good. Not only does it divide the world into hostile camps of “us” and “them,” but it overlooks the the total Lordship of Christ. Relying on fear is tantamount to retreating into our foxholes after the battle has been won, and shaking our fists at the fallen instead speaking comfort and resurrection. This is all (posts and comments alike) most excellent. Likewise, I almost feel a clichely used verse would be relevant: “for God gave us a spirit not of fear but of power and love and self-control.” (2 Timothy 1:6) Running around saying, “Oh no! Unless we do something the evolutionists are going to steal our children away from God’s truth!” reeks of a fear-based mindset. It acts like we’re somehow at a disadvantage. Our attitude should instead be: God is sovereign, His Word is living and active, and no lie or scheme can thwart His purpose. When we’re on His side, we are more than conquerors. Thus, “we are not waging war according to the flesh. For the weapons of our warfare are not of the flesh but have divine power to destroy strongholds. We destroy arguments and every lofty opinion raised against the knowledge of God, and take every thought captive to obey Christ.” (2 Cor 10:3-5) We can walk into the room knowing that God’s truth can systematically skewer every silly argument and opinion that sets itself up against the knowledge of God. We can be confident enough to have fun and a bit of humor and laughing while tearing down the lies, because God has already triumphed over evil. We are so confident in God that we can show love by respectfully allowing others to explain why they believe what they believe without fearing that we will be corrupted by their view. This is the mindset filled with a powerful, loving and self-controlled spirit, instead of a fearful, panicked spirit. By the way, doesn’t that trio of words — power, love, self-control — just ring of swashbuckling-ness? 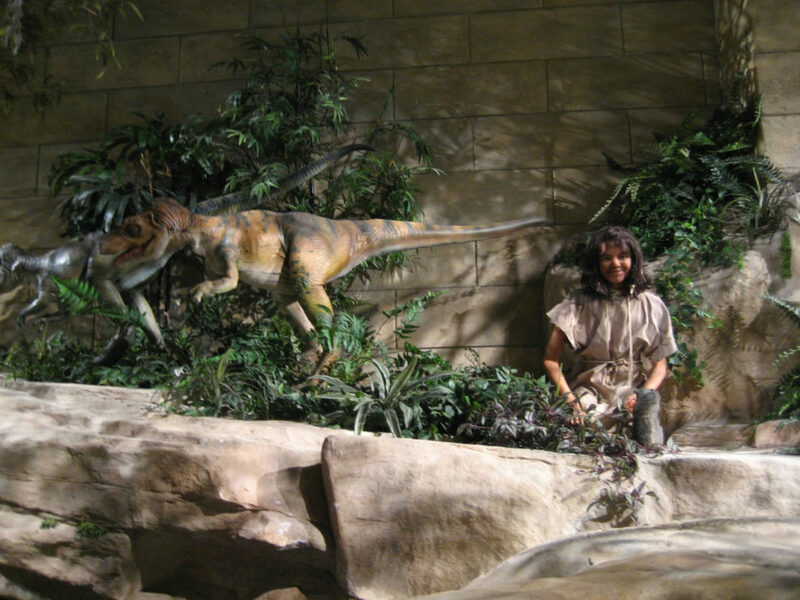 I’ve been to the Creation Museum myself–it is beautiful, no doubt about it. But I agree that fear-based marketing is not the best approach. Recently I’d listened to youtube debates with Ken Ham, and he does a great job with his control and confidence. Swashbuckling describes it perfectly. It solidified by own belief. Ken is sometimes falsely represented as saying that you aren’t a Christian if you don’t believe in a literal six days. He comes down hard on what he believes is creation’s truth, but that’s his job. This is a huge problem not by any means limited to AiG. And it is, as you stressed in your challenge to AiG on Facebook, a problem of marketing, of perception, and of tone, rather than of substance. But, since the tactics of fear work so dang effectively in the short-term, it’s a rather difficult problem for people to grasp. Fear is good fuel for the desperate sprint, the climactic endgame, the last gasp. But it’s so effective as a motivator – I think – precisely because it demands and consumes so much mental and emotional energy. A terrified man can run very fast. But who wants to be terrified all the time? It’s simply impossible to sustain that level of concern throughout the everyday humdrum of life, especially when the proverbial water-filled frying pan starts looking like a comfortable jacuzzi to our little frog-brains. A ministry running on fear is a ministry with limited life-expectancy. You see, my fear could only take me so far. It sustained me quite well for all the scrappy short-term engagements, but held no power to keep me on my feet for the long-term duration of the larger war. Fear is a tactical tool, not a strategic one. If we rely on it too heavily, our position becomes vulnerable indeed. For what if our fears get realized? What if we lose the battle? Will we throw up our hands, imagining the war itself to be over just when our courage is needed most? It’s been a painful amusement for me to listen as all the conservative commentators out there who drank their fill of fearmongering prior to November 6th attempt to pick up the pieces and move on. If the president’s reelection really was the end of the world like they insinuated, then what’s the point of even trying anymore? Shouldn’t we just all crawl back into our cozy Hobbit-holes and await the coming of Saruman, or slink off to some dignified pyre in the halls of Rath Dínen? This is the end I fear for ministries – like AiG – that demonstrate a proclivity for negative reinforcement: not only that they themselves end up petering out, swamped by the accumulating psychological weight of their own lost battles, but that they alienate their target audience through unattractive reactionary crotchetiness and numb the senses of their loyal supporters with an endless stream of ubiquitous urgency. Thank you for the balanced and cool message. This needs to be said. Among Christians, there is far too much ill-will between Young Earth creationists and Old Earth/progressive/theistic creationists/evolutionists. Admittedly, AiG and the prominent voices of the Young Earth movement do not say that all Christians who believe in an “older” earth are hell-bound hypocrites. However, there is a ton anathema and spite, at least it seems that way to me. The Young Earth movement needs to police itself more, to watch its own statements for the arrogant attitudes it condemns in others. I know a fair bit about Young Earth theory. 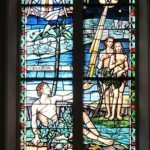 I go to a church that, I think, officially endorses Young Earth Creationism. I went to a Christian school and studied scientific evidences against evolution. I read the books The Genesis Flood and Scientific Creationism and Evolution: The Fossils Still Say NO! (by Duane T. Gish, a boring and very technical read). I believe that we all inherit the responsibility to try to discern truth as well as we can despite the fact that we are all stupid and blind and will misunderstand. I cannot accept the things that I was taught simply because I was taught to believe them. On the other hand, I certainly can’t accept the prevailing cultural opinion simply because it is the prevailing cultural opinion. So, I agree with many of the Young Earth evidences and conclusions. The scientific basis for the worldwide Flood is strong. I believe in the worldwide Flood. The scientific facts, as far as we know them — our knowledge is always uncertain — generally fit Young Earth Theory better than evolution. However, I don’t believe that evolution is the only alternative to Young Earth Theory. AiG makes it out that Young Earth Theory is the plain truth, and all other theories are variations of the same falsehood. That’s simply not true; Old Earth and Gap theorists have more in common with Young Earthers than with secular evolutionists. And even though I disbelieve theistic evolution, it has an undeniable place in Christian history, because sincere people with visible Christian testimonies have held to that theory. There are some scientific facts that don’t fit in very well with Young Earth theory. Namely, the “humanoid/hominid” fossils. Creationists don’t know which ones were “human” ancestors and which ones were animals. This doesn’t mean that they evolved, but it does mean that there were creatures in pre-history that may have been sentient and spiritual, but that were not exactly the same as humans today. I think this is a difficulty for Young Earth theory, because claiming such a young date for the Earth leaves very little time for pre-historic ages and races and wars and and catastrophes legends and extinctions. I think I might even still believe that the universe is “young,” but I don’t want to believe that. When I was reading those books, I would try to pretend that the revelation of a “young” universe made my reality more special and significant, but I couldn’t shake the lingering feeling that it really makes this universe less wonderful and less awesome. The thought that the Earth is really only six or eight thousand years old fills me with disappointment. I want to believe that there is more to God’s creation than this short, disappointing span of human history. Young Earth Theory essentially claims that we know almost everything that has every happened at all, since other worlds are also categorically ruled out of God’s creation and we expect that this Age will soon end with the return of Christ. But I don’t think that it is so blasphemous to suppose that an infinitely creative God would create ages or worlds that we have no concept of. Part of my problem lies in the use of the word “young.” If Young Earth Theory is true, then the Earth is not “young” at all. The word “young” is used as a reaction against secularists and their nebulous “billions of years…” But the word “young” is inaccurate. Six thousand years is a long time. A person who lives to be 100 is old, and an artifact that lasted for 2,000 years is ancient. Therefore, Young Earth Theory should really be “Ancient Earth Theory.” If it is true that there are only six or eight thousand years in the whole chronology of the universe, than those six or eight millenia are all the more ancient and mysterious! In my opinion, Creationists need to stop minimalizing the mysterious wonder of the ancient Earth through reactionary labeling. That is what has alienated me. I prefer the Gap Theory, although I have no scientific or theological evidence to suggest that it is more likely to be true than Young Earth Theory. These are good points to mull over. We don’t want to appear fear-based, but not underestimate the enemy either. Fear can actually be healthy in some ways. I read your FB posts with Ham’s site and I thought they were well thought out. Trying to reach this culture with the truth is ticky business. How can we creatively do that? That’s what I’m praying over this week.